A Mobius, 2 Mercurys, a Half Dozen Silver Mics, R.A.P. etc. Thirty plus years creating radio commercials and the awards tend to pile up. Handy if you hope to impress people but not much use to advertisers looking for solid results. 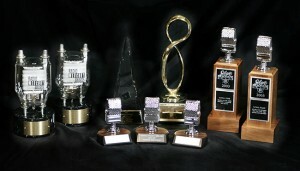 Experienced radio creatives will tell you, “Awards don’t necessarily signal successful advertising. Happy clients are the true goal for anyone seeking longevity in this business”. Some of those guys are just jealous. and making call center phones ring incessantly!